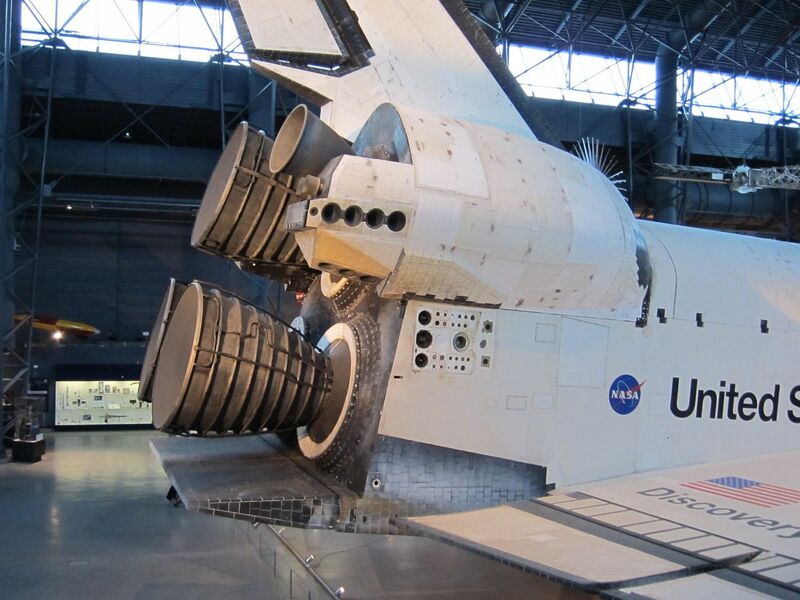 I am looking for details on the Space Shuttle Orbiter Vernier Reaction Control System (VRCS), used for fine maneuvers on orbit, such as docking. Wikipedia has very little information on the system. Googling the topic finds no pages devoted exclusively to the system. I'm especially interested in the placement of the thrusters, and the force that each could provide. 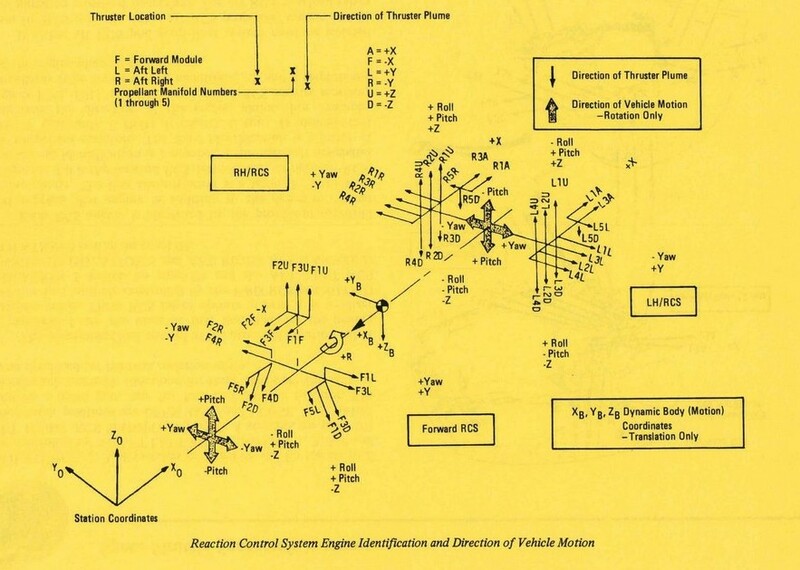 How were the thrusters arranged on the vehicle? Obviously there were no thrusters on the ventral face, as that would interfere with the heatsheild. So how less efficient were the canted thrusters? How accurate were the thrusters? 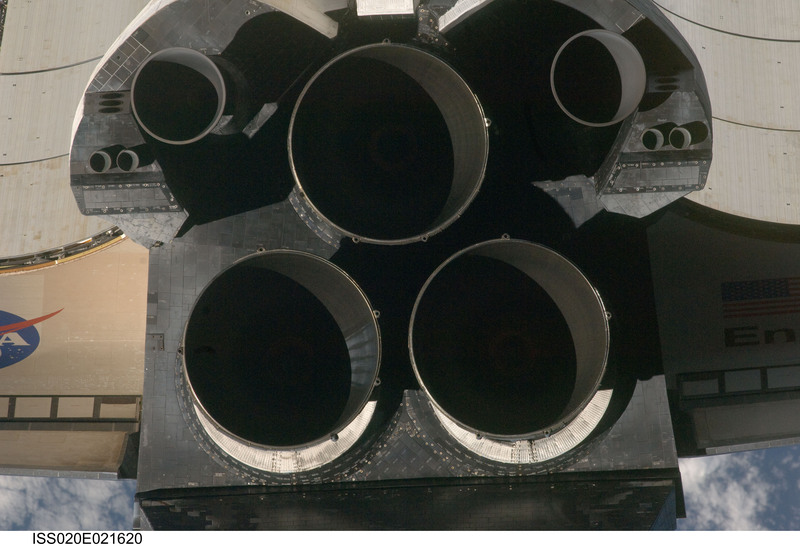 Other than this beautiful view of Discovery's front VRCS thrusters, I can find no other close up images of the system. Specifically, I can find no information on the rear thrusters. The shuttle RCS was divided into 6 VRCS jets and 38 Primary RCS jets. It was also divided into three pods - left aft, right aft, and forward. Each pod had its own helium pressurization, fuel, and oxidizer tanks. The aft RCS pods could be connected to each other to share their propellant supplies. There was also a 6000 lbf Orbital Maneuvering System (OMS) engine in each aft pod with its own tanks. The plumbing for the OMS engines could be interconnected with either or both aft RCS pods. There was no interconnect with the forward pod. The plumbing is both interesting and complicated - see the references for details. The VRCS jets burned nitrogen tetroxide and monomethyl hydrazine at a mixture ratio of 1:6 and a chamber pressure of 110 psi. The thrust was 24 lbf. 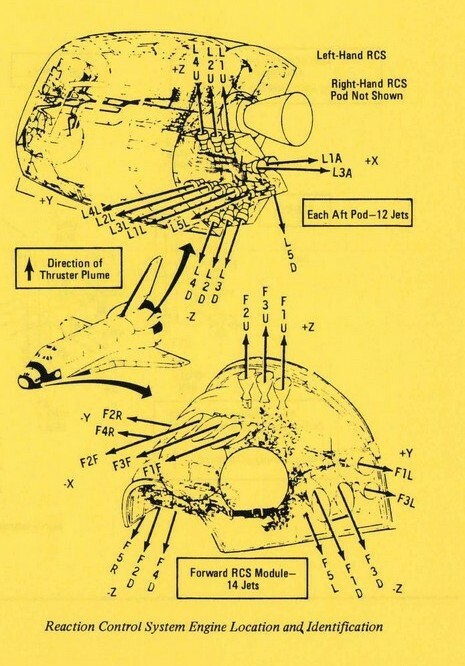 The expansion ratio varied from 20:1 to 50:1 (the jets were cut off ("scarfed") to fit the outer mold line of the vehicle). The maximum continuous on time was 125 seconds, the minimum was 80 milliseconds. There weren't any up-, forward- or aft- firing verniers, only left, right, and down. 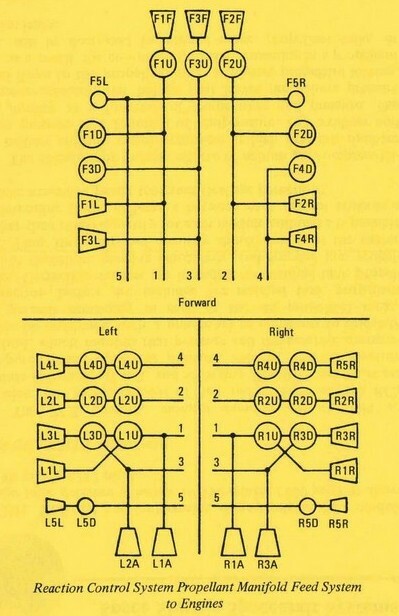 On these following diagrams, the verniers are always in manifold 5 so their names are X5Y where X=pod Y=direction. The Primary jets burned the same fuel and produced 870 lbf at 152 psia chamber pressure and the same mixture ratio. Their expansion ratios varied from 22:1 to 30:1. They had the same time constraints but allowed for a contingency deorbit burn of 500 seconds for the aft jets. You can get some awesome pictures of the aft of the shuttle including the jets from the inspection photos taken from ISS, like this one. Besides the Press Manual, there is a lot of great information in the Shuttle Crew Operations Manual section 2.22 about the RCS. For information about using the RCS to maneuver the vehicle, see this question: How fast can the space shuttle change its attitude in space? Not the answer you're looking for? Browse other questions tagged space-shuttle orbital-maneuver or ask your own question. 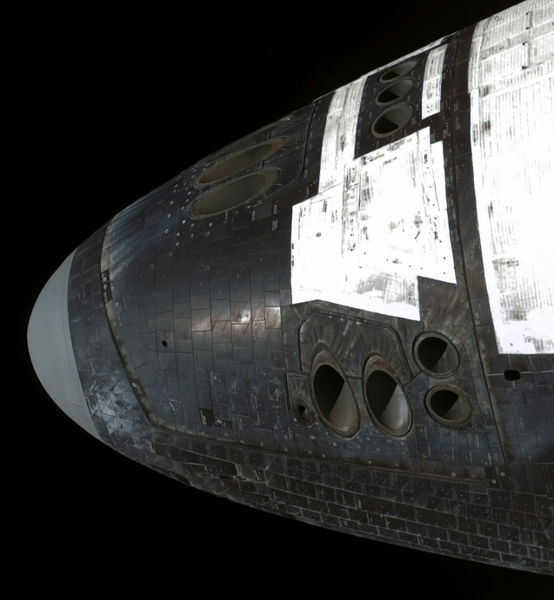 How fast can the space shuttle change its attitude in space?